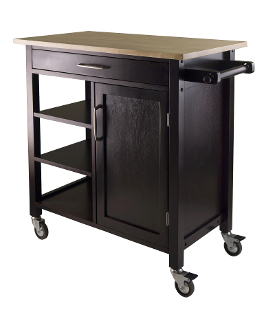 Mali Two-Tone Kitchen Cart features natural wood top with dimension 33"W x 18.5"D and espresso body with one large drawer, 3 shelves and cabinet with one removable shelf. Drawer inside dimension is 24.80"W x 13.31"D x 2"H. 3-Open shelf sizes 12.83"W x 15.75"D. Cabinet opening 13.39"W x 14.72"D x 22.44"H, Door Opening 13.22"W. Shelf inside cabinet is removable and fixed one position. Made of combination of solid and composite wood in Natural and Espresso Finish. Assembly Required. Drawer inside dim 24.80"W x 13.31"D x 2"H. 3-Open shelf surface size 12.83"W x 15.75"D.
Cabinet opening 13.39"W x 14.72"D x 22.44"H with one shelf is removable and one fixed position.